Telangana VV's/Vidya Volunteers results Merit List-Provisional Selection List 2017- Allotment, Appointment Orders Final Merit List@cdse.telangana.gov.in. Recruitment Notification 2017 for VVs/Vidya Volunteers in Telangana Vidya Volunteers 11428 Posts Recruitment Notification 2017 Vidya Volunteers/ VVs/Academic Instructors Recruitment in Telangana Apply Online at ssa.tg.nic.in from 01.06. 2017 onwards. Recruitment of VVs Vidya Volunteers in Telangana State Govt of Telangana agreed to Appoint 11428 Vidhya Volunteers in existing vacant posts as per Strength as on 30.06. 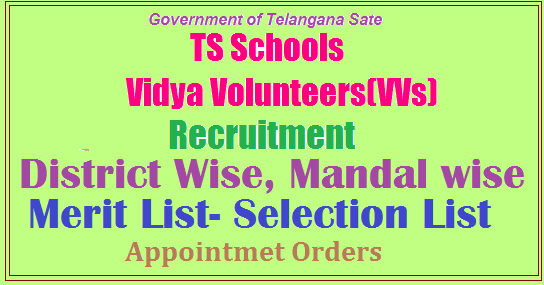 2016 Aspirants to work as Vidya Volunteers applied Online @http://cdse.telangana.gov.in .The applied candidates for Vidya volunteers of Telangana are awaiting for Merit list DSE is certainly one of the most awaited result in the state of Telangana. DSE is going to publish the TS vidya volunteers merit list 2017 of 31 districts on 9th June 2017 which consists of various VV posts on their official web site http://cdse.telangana.gov.in/home.do or http://183.82.107.60:8080/vvs2017/. DEO's will publish vvs final merit list through its official website on 10th June 2017 and display of final selection list by the deo's on 11th June 2017. So applicants can view of TS vidya volunteers merit list 2017 with mandal wise and district wise from here. The DEO shall communicate the list of schools along with roster points to the Mandal Educational Officer concerned for engaging the Vidya Volunteers. The Mandal Educational Officers in turn shall display the details on the notice boards of the Mandal Resource Centers, Primary Schools ,Upper Primary Schools, High Schools and all Gram Panchayats in the Mandal . The District Educational Officer shall give press note stating that the eligible candidates shall apply through online and display the details on his website. Telangana DSE released the official vidya volunteers notification through official website. DSE has finished of TS vv's online application process between 1st July 2017 to 5th July 2017. Now they are plan to release tentative merit list of vidya volunteers with mandal wise and district wise through http://183.82.107.60:8080/vvs2017/. If any objection on merit list, applicant send reasonable objection through given format to DSE. PROCEEDINGS OF THE COMMISSIONER & DIRECTOR OF SCHOOL EDUCATION ::TELANGANA Rc.No.44/PS2-2/2017 Date: 30.05.2017 It continuation of this office proceedings all the District Educational Officers in the State are informed that instructions were issued to engage Vidya Volunteers through SMCs during 2017-18. As per the guidelines communicated therein the candidate shall apply online and submit a signed print out of the application he / she uploaded along with the certificates required to the Mandal Educational Officer of the Mandal to which he/she applied within the time specified. The Mandal Educational Officer shall cause verification of the applications with reference to the Certificates enclosed and submit to the District Educational Officer duly countersigned. Engaging of Vidya Volunteers in Agency area shall be from local ST candidates only. If local ST candidates are not available ,then other ST candidate from Agency Area and later non-ST candidates residing in the Agency area shall be considered . Candidates should have completed 18 years of age and upper age limit is 44 years as on 1st July, 2017. (5) years relaxation is given in case of SC / ST/BCs and (10) years for Physical Challenged persons. TS Schools VVs Recruitment 2017 Schedule. Intermediate with D.Ed. In case of non availability of candidates with D.Ed, B.Ed candidates may be considered. b) For Upper Primary & Secondary Schools(Classes VI to X): Graduation with B.Ed. & Above. i. Graduation with the language concerned as optional and Pandit Training or B.Ed., in the relevant methodology. ii. Post Graduation in the language concerned with Pandit Training/ B.Ed. with relevant methodology. iii. Oriental Title/ Bhasha Praveena/ Vidhwan in the Language concerned or its equivalent with Pandit Training/B.Ed in the relevant methodology. ii) Local Candidate Certificate or Study Certificate issued by the Tahasildar . iii) Caste Certificate issued by the Tahasildar ( Local Tribe Certificate in case of Agency area) . iv) Physically Challenged Certificate ( SADAREM ). If weightages of two or more Candidates are equal, qualification and then age shall be taken into consideration for arriving at the order of Candidates in the merit list. Mandal is the unit for engaging of Vidya Volunteers basing on the roster points allotted to the Mandal. Merit lists shall be generated for each Mandal. As far as possible Candidates belonging to the same Mandal shall be engaged as Vidya Volunteer. If qualified Candidate is not available for a particular roster point in the Mandal, Candidates from the other roster points may be taken from the same Mandal. For Example : If no ST (W) Candidate is available in the Mandal , ST (Men or Women) i.e., General (G) may be considered . If no ST candidate is available in the Mandal , SC (W) may be considered . If no SC (W) Candidate is available in the Mandal , SC (G) may be considered . If no SC candidate is available in the Mandal ,following sequence shall be followed BC A (W),BC A (G),BC B(W), BC B(G),BC C(W), BC C (G),BC D(W), BC D (G), BC E(G) , OC(W),OC(G) . If Candidates are not available in the Mandal , same category of Candidates from neighbouring Mandals may be considered based on merit. The DEO shall place the merit list of the Candidates so prepared before the District Level Committee comprising – District Collector; Project Officer, ITDA/Addl. Joint Collector/Chief Executive Officer, ZP and District Educational Officer as the Member Secretary. The District Collector shall personally head this Committee and oversee the entire process of engaging these Vidya Volunteers. After finalisation of the lists of Vidya Volunteers by the District Level Committee, the same shall be communicated to the Mandal Educational Officers for onward communication to the School Management Committees for engaging the Vidya Volunteers in the school. Any grievance on the above order lies in Appeal to the Director of School Education within a week from the date of publication of the lists by the SMCs.The Cluster Head Master concerned shall be given the responsibility to coordinate with the SMCs concerned in engaging Vidya Volunteers. SMCs will enter into an Agreement with the Vidya Volunteer in the prescribed format.